In this post we take a closer look at the traditional life and settlement patterns of the Huichol Indians. The origins of the Huichol are unclear. The Wixárika themselves believe they arrived in the Jalisco-Nayarit area from the Valley of the Mexico, though most anthropologists believe it is more likely that they came originally either from the north or from the Nayarit coast. In the Huichol heartland area (shown on the map) the rainy season normally begins in June and lasts until October, a similar timing to most of central and western Mexico. While average temperatures in the area are usually between 15 and 20 degrees Centigrade, there can be sharp frosts in winter. Huichol family groups rely on the subsistence farming of corn, beans and squash, which are grown together in a small plot or garden (coamil). Tomatoes, chiles and gourds are also produced, Cultivation is often on steep slopes. Land is cleared by slash and burn. A few cattle may be kept, largely because of their value as trade items. Meat is rarely available except on ceremonial occasions. Some fishing is practiced, and wild plants also form part of the typical Huichol diet. Merchants supply other items such as salt, shells, feathers, canned drinks and sandals. The typical Huichol home is a simple, one-room dwelling, usually rectangular in plan, with a thatched roof. Some homes have a second room for cooking. The isolation of the Huichol has enabled them to retain almost all of their traditional customs. Anthropologists who have lived among the Huichol affirm that religion for the Huichol is not part of life, it is life. Three of the most important symbols for the Huichol are deer, corn (maize) and peyote. In some ways, these three items underline the fact that the Huichol culture has undergone a transition from a lifestyle based on hunting and gathering towards one based on sedentary agriculture. Santa Catarina (elevation about 1000 meters above sea level). Santa Catarina is a day’s walk from the nearest airstrip. San Sebastián (elevation 1400 meters). Tuxpan (aka Tuxpan de Bolaños; elevation 1060 meters). San Andrés Cohamiata (elevation 1860 meters). This has the best airstrip and is the main Huichol ceremonial center. While many of the people did not adopt Catholicism, San Andrés has more services, including a medical clinic, and more working opportunities. Guadalupe Ocotán (elevation 1050 meters). More of the Huichol living here accepted Catholicism and are more acculturated. Most children attend school; many people wear “mestizo” clothing. Each of these districts has its own autonomous government, and there are relatively few formal links between the districts or “communities”. Each community is headed by a governor (Tatohuani), with the office transferred to a new leader every January following an elaborate ceremony. Each community also has a parallel religious government headed by its shamans (maraakames). The transportation challenges in this region are evident from the number of small airstrips shown on the map and the paucity of road links. Villages only 5 or 10 kilometers away from each other “as the crow flies” may be almost impossible to travel between because of the river canyons and steep slopes. A relief map of this area shows that most settlements are perched on whatever flatter land is available, often on the plateau top. Given the lack of formal links between districts, and the terrain, it is not surprising that the settlement pattern in the Huichol heartland area is highly dispersed, with a very large number of tiny settlements, mostly kinship settlements where all members belong to the same extended family. 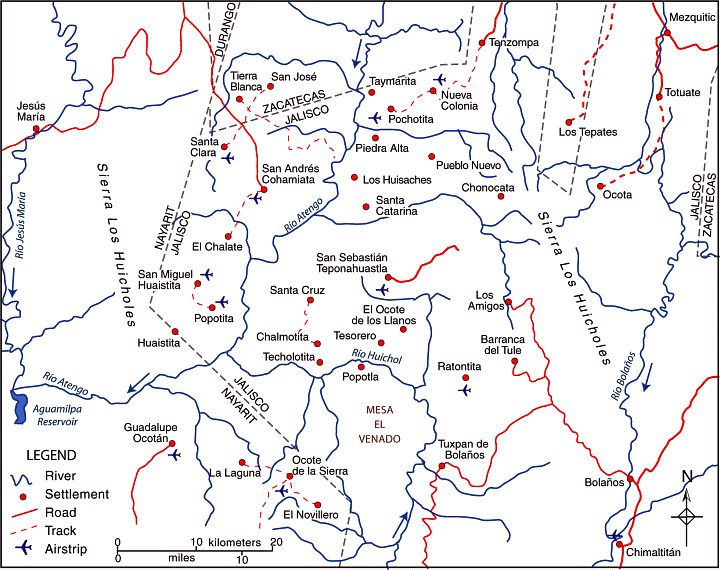 There are more than 400 distinct settlements (rancherías or ranchos) in the region and many of the settlements are a considerable distance from their nearest neighbors. This part of Mexico exhibits one of the clearest examples in the country of dispersed rural settlements. What does “development” mean in the context of the Huichol Indians? Does this dispersed settlement pattern inhibit the future economic and social development of the Huichol people? If so, how does it do so, and what could be done to overcome the difficulties it causes? Would development be easier if most or all of the small scattered communities were congregated into a smaller number of larger settlements?